Free half-day workshop presented by Hawaii Department of Agriculture. Dawn Masako Mones. Dawn graduated from Kapaa High School and she will be attending California Polytechnic University to study Tropical Plant Science and AgroEcology. Madeline Rausch. Madeline is a graduate of Kapaa High School and is planning to attend California Polytechnic University to study Agricultural Business with a concentration in Viticulture. Carlie Ann DeSilva is a graduate from Kapaa High School and is planning to attend University of Hawaii at Hilo to study pre-veterinary medicine. Casandra Kawamura is a 2010 Kauai High School graduate attending the University of Hawaii at Manoa studying animal science and striving to become a large animal veterinarian. Angela Dunsmoor-Connor. She graduated from Kauai High School and is the daughter of Joseph Dunsmoor, who farms at Waipa. Angela will be attending University of Notre Dame and studying engineering. Ting Huang. Ting is a 2008 Kauai High School graduate and is studying nursing at Kapiolani Community College in Honolulu. Ting's parents, Hannah and James, are active Kauai County Farm Bureau members and own Kauai Glory Farm. 2013 is the first year Hawaii Tropical Flowers and Foliage Association (HTFFA), Kauai Chapter offered scholarships to students in college studying agriculture. HTFFA-Kauai awarded Teri Lau a $1,000 scholarship. Teri Lau attends Kauai Community College, works at the farm on campus and is studying horticulture. Join us for a night of fellowship and good dining with fellow farmers and friends of the farmer. New members and guests welcome! For more info on the new HTFFA scholarship click here. For more info on KCFB Annual Scholarships click here. 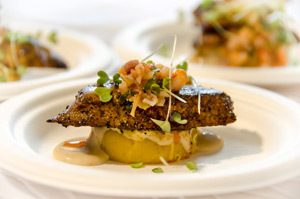 Celebrity Chef Cookoff winner at the 2012 Kauai Farm Fair! Ron Miller, Executive Chef and owner of Hukilau Lanai created the winning dish of the night, earning a $2,000 donation for the Salvation Army Soup Kitchen with his Kauai Coffee Spiced Seared Mahi Mahi served on Kabocha Pumpkin Puree with Chipotle Coconut Sauce and Kauai Shrimp and Kaneshiro Bacon Relish. If you believe that the United States Department of Agriculture (USDA) improperly denied farm loan benefits to you between 1981 and 2000 because you are Hispanic, or because you are female, you may be eligible to apply for compensation. The Kauai County Farm Bureau invites you to take time out of your busy schedule to join us for a night of fellowship and good dining with fellow farmers and friends of the farmer at Daryl Kaneshiro's Omao Ranch. Located one mile west of Koloa on Koloa Road. New members and guests welcome!